I love !!!!free!!!! stuff! 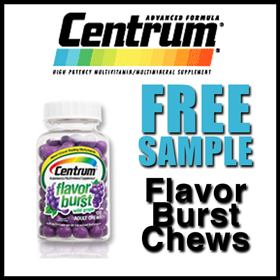 Get a sample of the exceptional brand Centrum’s Flavor Blast Chews, the greatest invention for taking vitamins. These vitamins are so tasty and easy to take. I know so many people that have a problem with swallowing their vitamins and other medications that this is a great alternative. They have great tasty flavors, Wild Grape and Mixed Fruit. Just so you know, you won’t even have to take them with some food or water! Most vitamin’s are difficult to swallow, being so large, but here you go, just chew yourself into your best healthy you! A terrific adult multivitamin which include essential vitamins that taste so good. Whichever flavor you enjoy the most, it will be a great change in your daily routine, without any hassle. With Emergen-C you will combat your immune system, gain energy, replenish your body after your workout and more. There are over 20 varieties of Emergen-C for you to choose from. I love the cranberry pomegranate! Emergen-C also has special formulas for your kids. They are a fizzy treat for the kiddies. They are tasty, healthy and fun at the same time. Plus, for every box of children’s Emergen-C, 25 cents is donated for a great cause. It goes to Vitamin Angels, to provide for one child for a whole year. The vitamins included in these drink mixes are safe and there is no caffeine and no crash when you use them. They have electrolytes for your post workout energizing. The different varieties of Emergen-C also are designated to help specific health needs, such as joint health, heart health, and more.